Due to the implementation of a proxy server a while back, we had to lock down a previously open environment in order to ensure all user’s web traffic was forced through the proxy server. This presented a problem of it’s own, controlling Safari & it’s proxy settings through Group Policy. Chrome, Firefox and IE are all relatively simple, but for love nor money I wasn’t able to find a way of group policying Safari. 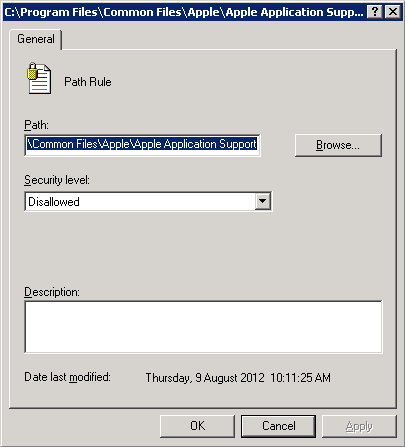 My next option was to disable Safari browser via group policy. As the fleet of computers are Windows 7 Professional, I wasn’t able to use Applocker… Initially, blocking Safari.exe from running on a machine via a Software Restriction Policy works – you get a denied message when trying to launch the application. However renaming the exe to Safari1.exe circumvents this control instantly. Then I noticed that when you launch Safari, a second process was spawns called WebKit2WebProcess.exe. I tried renaming this .exe and suddenly Safari stopped communicating with the internet . Now it loads Safari, and just refuses to do anything from therein. This entry was posted in Group Policy. Bookmark the permalink. One Response to "Disabling Safari Browser Via Group Policy"
Thanks Nick I used this solution and it worked a charm. Last time I blocked a safari I was in Africa, its long story though. Peace.